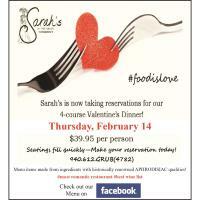 Sarah's is now taking reservations for our 4-course Valentine's Dinner! Seatings fill quickly - Make your reservation today! Menu items made from ingredients with historically renowed APHRODISIAC qualities!